Of course I tried to find out what device was responsible for that flood of packets, and after some searching in MAC address tables I found that there was an even easier way to determine what device it was: open up a web browser, enter the IPv6 address that was being renewed (in square brackets, like you have to, of course). And viola, there it was: an APC UPS network management card. Instead, I did what I always do when it comes to obviously bad IPv6 implementations: check for a firmware upgrade. It turned out that the firmware on the card apparently was from 2010, even though it had been bought just a month ago – so either it caught dust on some shelves for a couple of years, or APC is a little behind on delivering their products with the latest software. 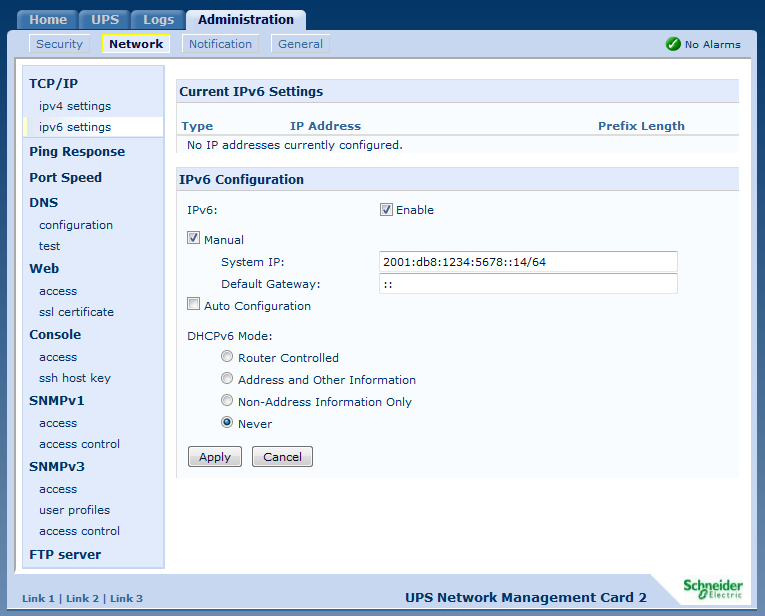 Anyway, I got the latest firmware from their website, flashed it, and finally IPv6 seems to be doing what it should. do you have somewhere a capture of those packets? I’m interested in the setting of some dhcpv6 fields. yes, I think I do have a capture but I’ll have to find it again first – it’s lost somewhere in my collection, probably because I did not care to name it accordingly. I’m going to send it to your email address when I find it.